A startup that plans to take Google Glass to healthcare and other markets has landed $8.4 million in venture capital. San Francisco-based Wearable Intelligence describes itself as a technology company dedicated to building enterprise solutions using wearable computing hardware -- such as Google Glass. It already has a partnership with Beth Israel Deaconess Medical Center in Boston, which is using Google Glass in the ER to give them medical information hands free. With Google Glass, clinicians can call up patient information on its tiny screen. "The deep technology knowledge and professional expertise of the folks at Wearable Intelligence, which I've personally experienced, will help us all accelerate the adoption of Google Glass in healthcare," Beth Israel Deaconess Medical Center CIO John Halamka writes in as testimonial on the Wearable Intelligence website. "Working on novel technology with Wearable Intelligence provides respite from an agenda that has been filled with meaningful use, ICD-10, ACA, and the HIPAA Omnibus rule," he wrote. 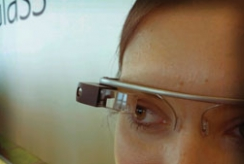 Wearable Intelligence is not alone in envisioning the use of Google Glass in healthcare. Last June, EHR company drchrono announced it would incorporate Google Glass in its platform. The idea is to create the first wearable health record -- one that is always mobile, Michael NusimowmCEO and cofounder of drchrono, said then. "Wearable technology is the next step in the evolution of computing platforms (from desktop to mobile to wearable), and as the first enterprise company devoted specifically to wearable technology we have the expertise necessary to solve difficult problems for real customers," company executives write on Wearable Intelligence's website. "Our mission is to empower every enterprise by giving their employees the right information in the right place at the right time," they add. The management team is made up of Yan-David Erlich, CEO; Ryan Junee, president; Chase Feiger, director of business development; and Eugene Mirkin Director of Engineering. Before he launched Wearable Intelligence, Erlich was the CEO of ChoiceVendor, a company he founded, ran and sold to LinkedIn in 2010. He was also the founder & CEO of Mogad, which was acquired by iSkoot, a division of Qualcomm. The other members of the executive team also founded and sold companies, and were associated with tech companies and consulting firms, including Accenture, Motorola and Castlight Health. Lightspeed Venture Partners, whose slogan is "Think big. Move Fast, led this second round of funding for Wearable Intelligence. Lightspeed partner Barry Eggers will join the company's board of directors. The funding was revealed in a filing by Wearable Intelligence with the Securities and Exchange Commission.